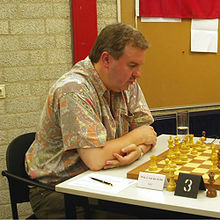 John van der Wiel (born 9 August 1959) is a Dutch chess grandmaster. He was awarded the Grandmaster title in 1982. He was the European Junior Champion in 1978 and the champion of the Netherlands in 1986. He was a participant in the Chess Olympiads of 1980, 1982 and 1984. He has competed in several interzonal tournaments: Moscow (1982) where he finished in 11th - 12th place, and Biel (1985) 4th - 6th place (where he lost a playoff for the final Candidates Tournament place to Nigel Short). His best results in the other international tournaments have included Sochi (1980) - 4th - 5th place; Wijk aan Zee (1981, additional tournament) 1st place; Wijk aan Zee (1982) 3rd - 4th; and Novi Sad (1982). In the past, he was a notable "computer killer".